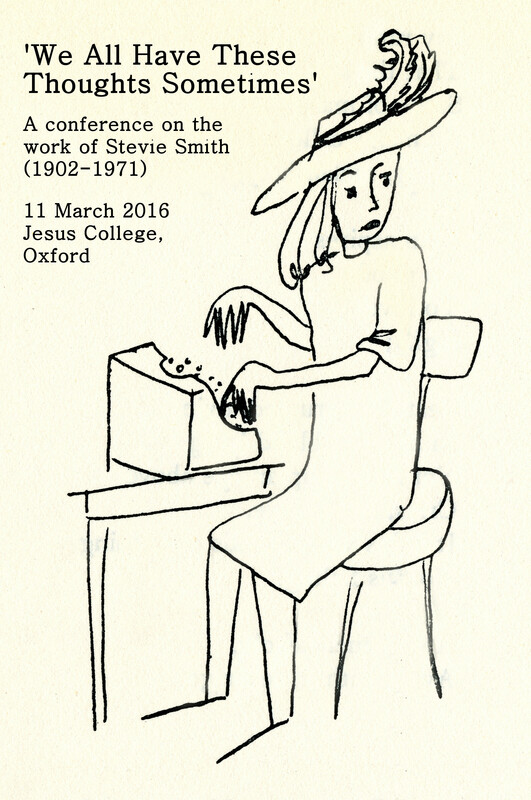 An extraordinary 72 people turned up to Jesus College on 11 March 2016, to talk about Stevie Smith. I like these photographs of the opening address (that’s me standing warily at the front) because the delegates look pleasingly numerous. Hermione Lee and Frances Spalding opened the conference with short presentations and a panel discussion which focused on Smith’s ‘The Story of a Story’. In the afternoon, Sally Bayley, my brilliant supervisor – she’s the one standing and declaiming on the right – delivered a workshop based around Smith’s Novel on Yellow Paper. Note all the yellow paper lying around, and in the typewriter. One of the last parallel panels of the day. Tom Cook speaking on Stevie Smith’s relationship to Philip Larkin, watched by both a corporeal and a ghostly mirrored audience. There are too many people to thank for what was an extraordinary event. I did an official thanks at the end, to all the speakers and sponsors and supporters. But right now I want to thank the amazing volunteers: Aliyah, Sinead, Jacob, Kristin and Glenn. I thanked them in a lump at the end, and in the abstract – but not for, specifically: quietly taking charge when tech stopped working, liaising with a restaurant which had lost the events menu, patiently standing and controlling the sound volume for forty-five minutes, and reassuring me when it all got a bit much. And for taking these amazing photographs. The photographer is Glenn Jeffrey, and you can (and should) hire him for events.